New York: Jonathan Cape & Harrison Smith, 1931. First edition of Faulkner’s first collection of stories. Octavo, original cloth, pictorial endpapers, blue topstain. Near fine in a near fine dust jacket with a touch of wear. A very sharp example. 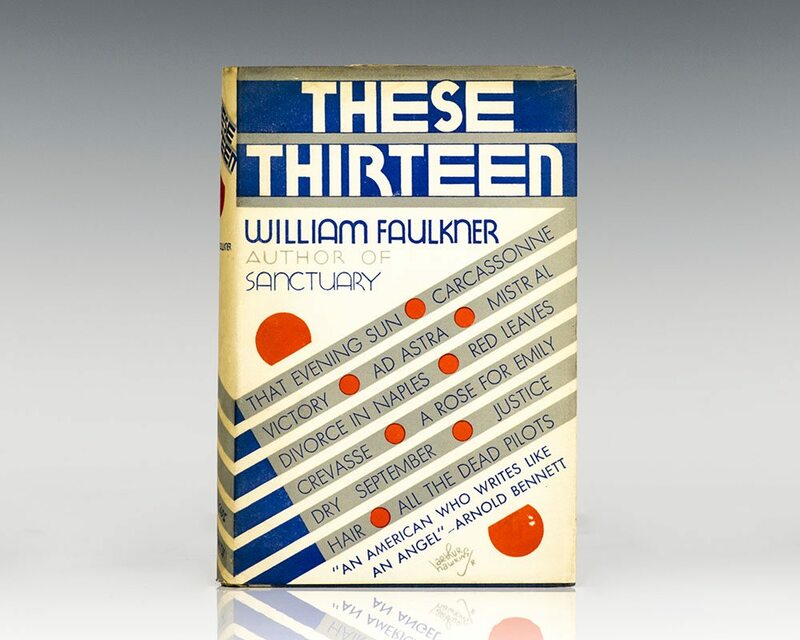 Appearing two years after The Sound and the Fury, Faulkner’s These 13 was issued on September 13, 1931 while he was writing the novel Light in August. 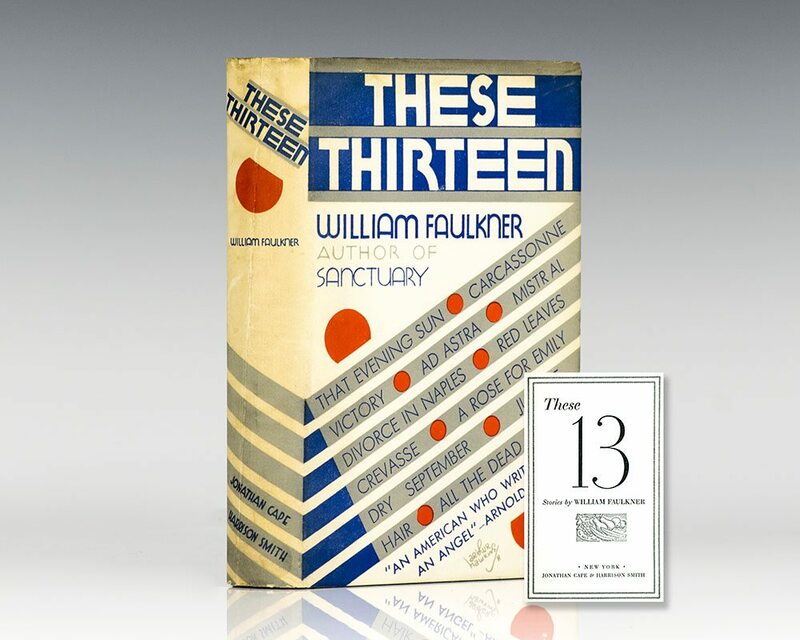 These 13 won early praise as a collection of stories that “are, for the most part, Faulkner novels in miniature,” with A Rose For Emily highlighted as “one of the strongest” tales, and That Evening Sun as “perhaps the most perfect story in the collection.” Faulkner is “the latest star in the American literary firmament… This collection of his short stories in unreservedly recommended” (New York Times). First edition of this classic Faulkner novel, which explores the lives of a family of characters in the South. Octavo, original cloth. Near fine in a near fine dust jacket with a touch of rubbing. Jacket design by E. McKnight Kauffer. First Edition of William Faulkner's Absalom, Absalom! New York: Random House, 1936. First edition of “the greatest American novel since the turn of the century.” Octavo, original cloth. Near fine in a very good dust jacket. Jacket design by George Salter. Signed limited first edition, number 153 of 450 copies. Octavo, original cloth. Signed by William Faulkner. Fine in the original acetate. Housed in a custom slipcase. 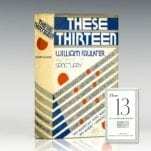 First edition of the first novel to win both Pulitzer and National Book Award. Octavo, original cloth. Fine in near fine dust jacket. Jacket design by Riki Levinson. New York: Harrison Smith & Robert Haas, 1932. First edition, first issue, with first printing statement on copyright page, and “Jefferson” for “Mottstown” on page 340, line 1; first-issue binding, lettered in blue and orange. Octavo, original cloth. Light offsetting to the endpapers, near fine in a near fine dust jacket with light wear to the crown of the spine. Housed in a custom half morocco clamshell box. Petersen A13a; Howard A13.1a; Massey 103. A very bright example. New York: Random House, 1959. First edition. Octavo, original cloth. Fine in a very good dust jacket with a closed tear to the spine. Third printing of the first novel to win both Pulitzer and National Book Award. Octavo, original cloth. 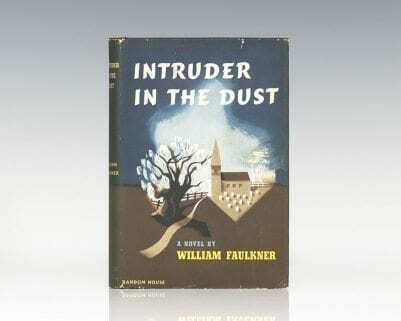 Signed by the author on the title page, “William Faulkner New York 3 Dec 1954.” Near fine in fine dust jacket. From the library of fellow writer Budd Schulberg. American screenwriter, novelist and sportswriter Schulberg is best known for his 1954 Academy Award-winning screenplay for On the Waterfront as well as his 1941 novel What Makes Sammy Run? inspired by the life of his father, early Hollywood mogul B. P. Schulberg. Jacket design by Riki Levinson. First edition of the first novel in Faulkner’s acclaimed Snopes Trilogy. Octavo, original cloth. Signed by William Faulkner on the half-title page. Fine in a near fine first issue dust jacket with ads for other books on the back panel (Peterson A22). Jacket art by George Salter. From the library of novelist and historian Shelby Foote. Housed in a custom half morocco clamshell box. Rare and desirable signed. New York: Johnathan Cape & Harrison Smith, 1931. 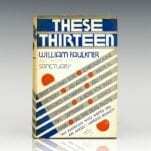 First edition of the novel that established Faulkner’s literary reputation. Octavo, original half cloth, pictorial endpapers. From the library of Virginia bibliophile and historian Christopher Clark Geest with his bookplate. Near fine in a near fine dust jacket. A very sharp example. New York: Boni & Liveright, 1926. 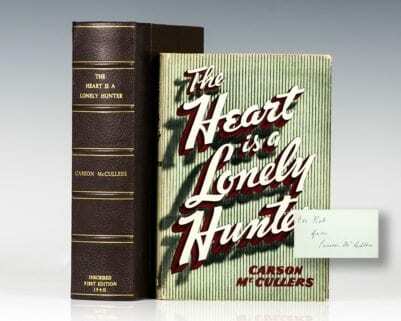 First edition of Faulkner’s first book in the rare first state dust jacket with An American Tragedy as the first of five titles listed on the rear jacket panel. Octavo, original cloth. Bookplate, near fine in a very good dust jacket with some toning to the spine and some chipping to the extremities. Housed in a custom clamshell box. Rare and desirable. The Sound and the Fury & As I Lay Dying. New York: The Modern Library , 1946. 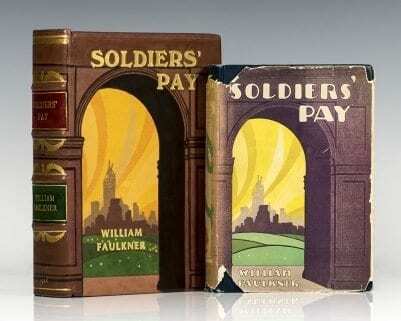 First modern library edition of Faulkner’s two great novels. Octavo, original cloth, pictorial endpapers. Association copy, inscribed by the author on the pastedown, “To Phil Stone from Bill Faulkner.” The recipient, Phil Stone and William Faulkner both hailed from Oxford, Mississippi, where they met in 1914. Stone, a law student, quickly became the Faulkner’s close friend and confidant; he was “uniquely fitted to serve as William Faulkner’s friend and mentor. He was a compulsive talker, a man who loved to teach and tell stories. Moved by impulses toward literary creation but lacking the drive to carry them through to fruition, he could satisfy them only vicariously. He would later say of himself, ‘I’m like an elaborate, intricate piece of machinery which doesn’t quite work'” (Blotner 44). As they grew older, Stone encouraged his friend’s literary interests: his secretaries typed Faulkner’s early work and he personally paid for the fine press publication of The Marble Faun, Faulkner’s first book. In turn, Faulkner would dedicate the three books of the Snopes Trilogy to Stone, and base characters on both Stone and his family. The lawyer Gavin Stevens, a major character in Intruder in the Dust and Knight’s Gambit, was based upon him. Near fine in a very good dust jacket. Housed in a custom cloth and chemise slipcase with gilt morocco spine label. Rare and desirable. New York: Boni & Liveright, Inc, 1927. First edition of Faulkner’s second novel. Octavo, original cloth, pictorial endpapers. Near fine in a near fine dust jacket with a small chip to the front flap. From the library of Virginia bibliophile and historian Christopher Clark Geest with his bookplate to the pastedown. A very nice example of this early Faulkner work. Signed limited first edition of the first novel to win both Pulitzer and National Book Award. Octavo, original cloth. One of a thousand signed numbered copies. Fine in the original glassine wrapper. The slipcase is in fine condition. A superior example, not often seen in this condition. First edition, first issue, with first printing statement on copyright page, and “Jefferson” for “Mottstown” on page 340, line 1; first-issue binding, lettered in blue and orange. Octavo, original cloth. Fine in an excellent dust jacket with some light rubbing and wear. Petersen A13a; Howard A13.1a; Massey 103. A nice example. First edition of Faulkner’s first book in the rare first state dust jacket with An American Tragedy as the first of five titles listed on the rear jacket panel. Octavo, original cloth. Bookplate, near fine in an exceptional dust jacket with light toning and wear. From the library of Virginia bibliophile and historian Christopher Clark Geest with his bookplate. Housed in a custom clamshell box. Scarce in this condition. First edition of Faulkner’s works set in Yoknapatawpha County, and introduces many of the characters that appear in his later fiction. Octavo, original cloth. Near fine in a near fine dust jacket with light toning to the spine. A very nice example. Signed limited first edition, number 154 of 450 copies. Octavo, original cloth. Signed by William Faulkner. Fine in the original acetate. New York: Harrison Smith and Robert Haas, 1933. 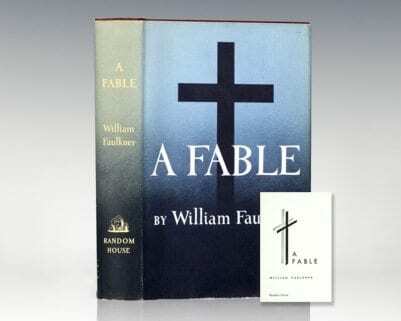 First signed limited edition of Faulkner’s second and final book of poetry. Octavo, original cloth, with two mounted cover illustrations and mounted frontispiece by Lynd Ward, vignette to the colophon. One of only 360 numbered copies signed by the author, this is number 189. In near fine condition. Housed in a custom clamshell box. An exceptional example.